Meritage Homes has become Inwood Village’s first tenant. They will be occupying about 16,000 square feet: 5,000 square feet on the first floor, 11,000 square feet on the second. Meritage indicated the site to be ideal because of the amenities, setting and flexibility to grow. The first phase of Inwood Village is currently under construction. When completed, it will offer 29 move-in ready office suites with 1,500 to 3,000 square feet in size. 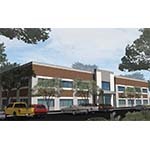 The Inwood Village 77,000-square foot office building at 2722 Bitters Rd is expected to be completed April 2019.